String Quartet: Gil Roddy ’18 looks towards the ball in the match against Colby College yesterday. The team beat the Mules 9-0, coming back after losing to Middlebury 8-1 last weekend. 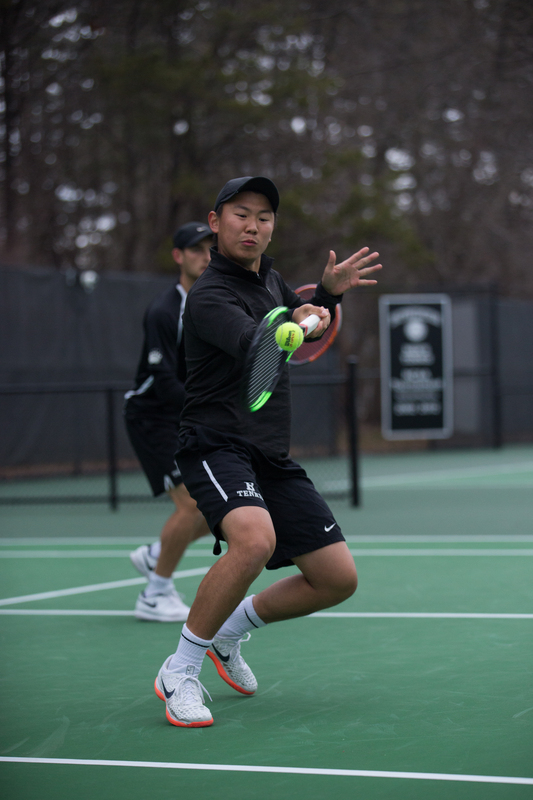 Ranked second in the nation going into weekend play, the men’s tennis team (12-1, NESCAC 3-1) suffered its first defeat of the season in a surprising 8-1 loss to No. 3 Middlebury (14-3, NESCAC 4-1) on Saturday, ending a 12-game win streak. With only five matches left in the regular season, the Polar Bears are striving to reclaim their top NESCAC position. The day before losing to Middlebury, the Polar Bears beat Brandeis (11-3) 6-3. 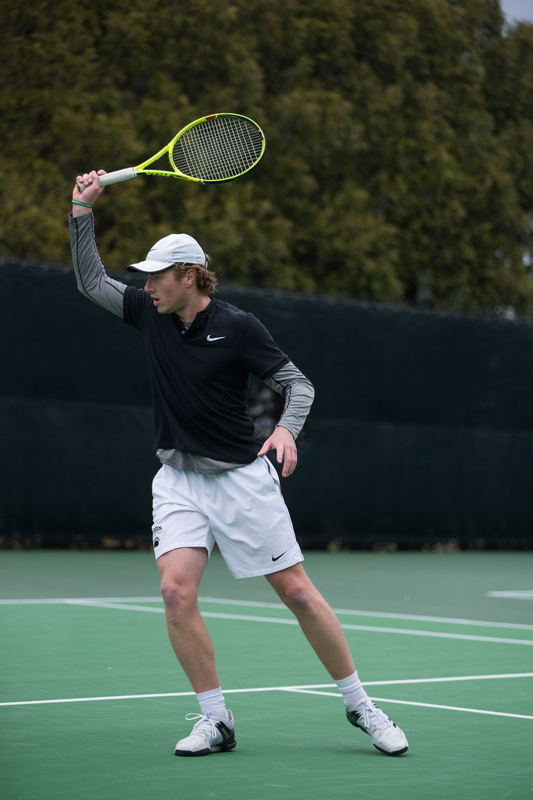 According to captain Kyle Wolfe ’18, these two matches differ from the matches played earlier in the season, specifically those over spring break in California, because of the closeness of the games. Middlebury is one of the strongest teams in the conference and one of Bowdoin’s toughest competitors for the NESCAC and NCAA championships. The two teams have faced off in the NESCAC finals for the past two years, with Bowdoin beating the Panthers 5-4 in 2017. Despite the loss, Wolfe maintains his confidence in the team, choosing to learn from its mistakes against Middlebury. Jerry Jiang ’19 competes in doubles play with Kyle Wolfe ’18. Bowdoin faced off against Colby (8-2, NESCAC 3-1) yesterday afternoon, beating the Mules 9-0. This game was an important primer for the more challenging competition against No. 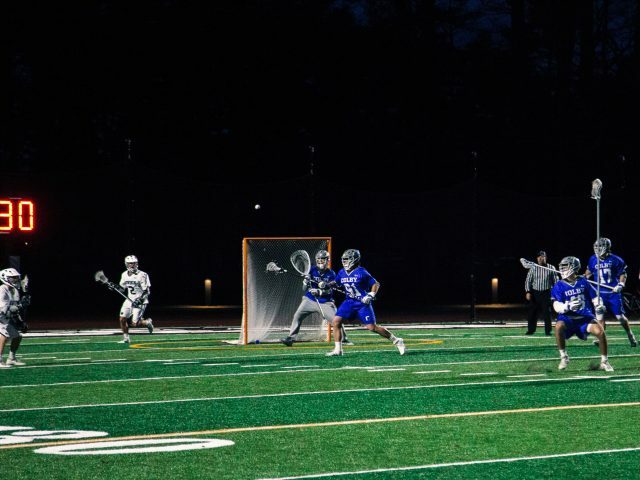 4 Williams (11-2, NESCAC 4-0) on Saturday. Roddy expressed concern that external pressures may have affected the mid-week Colby match more than the team’s actual skill. His concerns were unnecessary as the team finished with a victory. Going into the NESCAC tournament, the team is looking to play its best in order to match its opponents. “I think Williams will probably be the toughest team we have left on the schedule, but as it gets toward the end of the season a lot of NESCAC teams are trying to make the tournament and elevate their level of play as well, so these will all be pretty competitive matches,” Roddy said. The Polar Bears will look to stay in the win column against the Ephs at home on Saturday at 10 a.m.